Suppose you had a chance to gather up all the jewels you ever wanted! Sounds exciting? Of course with every treasure, there is one small catch. Designed as a jewelry box with six sides, HEXaGEM can be referred to as a Tetris-type game, but just a bit more complex. Jewels of various colors fly out randomly from the sides of our jewelry box and glide toward a big diamond located in the center of the box. You need to control these flying jewels by turning and attaching as many as you can so they form hexagons. It's a game for those of you who are swift and shrewd. This ain't child's play, this takes brains and dexterity. You didn't expect to get a treasure without some effort, did you? Why not download our game and see what a treasure hunter you are? You get to play until the 3d level and hit 1000 points. We are talking free! If that isn't a treasure I don't know what is. Once you've experienced the excitement and fun we know you'll want to have the full version. 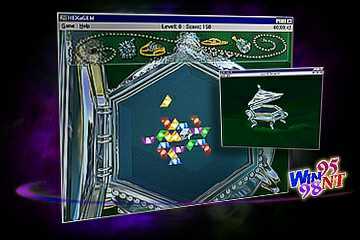 Gather all the jewels you ever wanted, no lottery involved, just your quick mind and finger tapping skills.